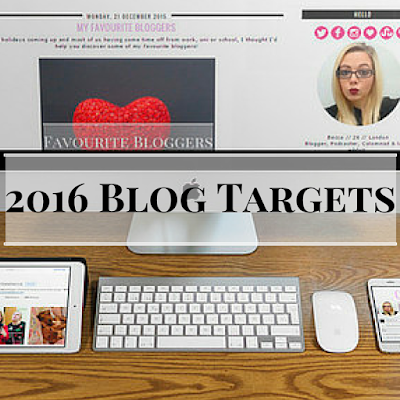 I didn't set myself any targets last year except for to keep on blogging and love what I was blogging about. I can safely say I smashed that goal. So what does 2016 have in store for me? As this year was my first year in blogging I decided not to be too harsh on myself and just make sure I kept up with new content and enjoy blogging. So now I've been doing it for a while, I thought it's time to get my game on and set myself a few targets. I'm not a massive blog numbers kinda person but I do like to keep an eye on them. Have you got any targets for 2016? Good luck with your targets - they seem totally achievable :) I haven't really thought about any targets for my blog, I rarely set myself them as I find blogging 'fun' rather than something I measure and plan out loads. But I think it might be good for me to do so next year! I'm with Milly - I haven't really thought of any targets for my blog either, but I really should!! Good luck with hitting your targets in 2016! Woo these all look like really good goals! I haven't set any specific ones for mine yet, but I want to do a redesign and then go from there! I love reading about peoples blog goals! I have some of my own that I'll be posting soon. I hope you managed to reach yours! I want to set mine this week, I went a little off target last year due to having a baby so hoping 2016 is my year! My biggest goal for next year is to start feeling that me and my blog is good enough.